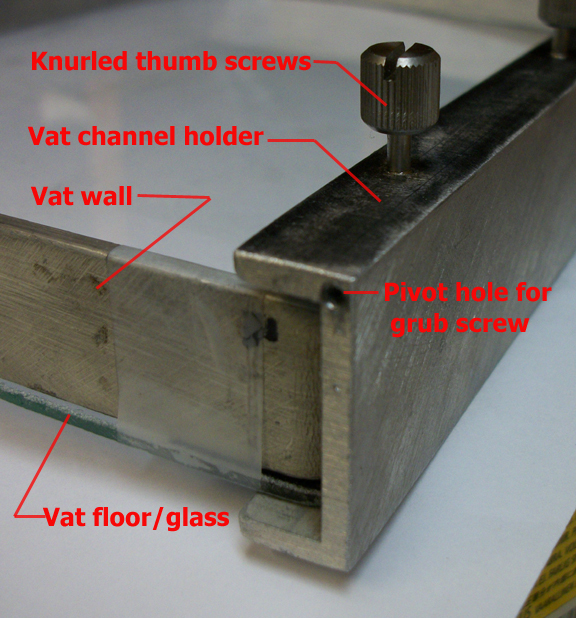 Caption: The Vat channel holder ,The thumb screws are for VAT removal and cleaning. The glass bottom is just taped on for now. I think I have finally figured out the silicone surfacing technique.I can get it down to a few microns thick with excellent adhesion to the glass.Hope it will provide a good hydrophobic surface on the vat floor for the resin.I am using pure 100% clear using silicone for now. Optical aberration and refraction and UV filtering is my main concern at this point. The layer thickness of the silicone is probably 5 to 10 microns. I will also post a short video on the technique.